Kevin McDonald, Young Men’s Chorus conductor, at a Boston Latin School rehearsal. On Saturday mornings at Boston Latin School from September through May, the halls echo with the voices of about 200 young singers, the students of Handel and Haydn Society’s Vocal Arts Program. They range in age from 8 to 18 and come from as nearby as surrounding Boston neighborhoods and as far away as Warner, N.H.
On May 3 and 5, the program’s two most advanced high school-age groups — the Young Men’s Chorus and the Young Women’s Chamber Choir — will join the Handel and Haydn Society Orchestra and Chorus to perform Mozart’s Requiem under the baton of H+H artistic director Harry Christophers, performing in most of the landmark work’s choral movements. 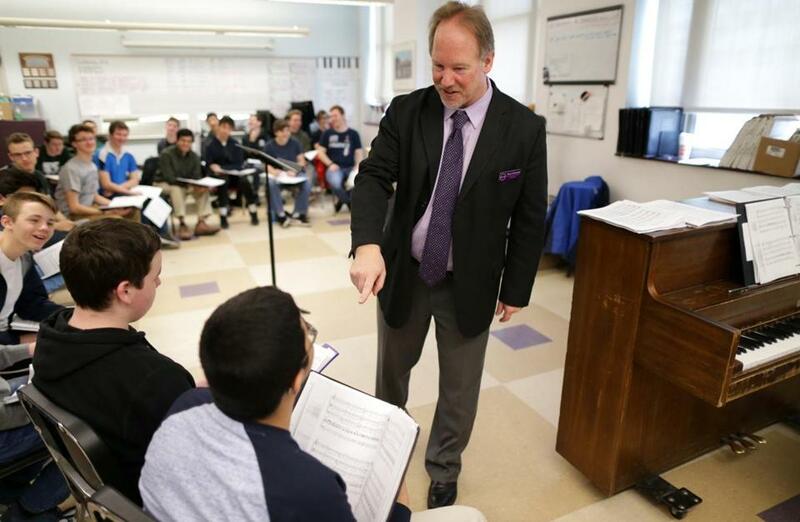 Kevin McDonald, conductor of the Young Men’s Chorus, also teaches at Wellesley High School. He spoke with the Globe about what it means to these local teens to take the stage with professional performers. Q. Does the youth program tend to draw more girls than boys? A. That’s exactly right. The reason why they brought me on five years ago was to try to help build interest in the Young Men’s Chorus. When I took over the program there were about 13 guys enrolled. Now, on a consistent basis we have anywhere from 30 to 40 guys singing per semester. The overall quality of the group has progressed as we’ve been able to cultivate it. Q. How often do the Vocal Arts Program students get to perform alongside the professional choir with H+H? A. There are lots of incredible performing organizations in the area that students can choose to participate in, and one of the absolute spectacular things that the Handel and Haydn Society is able to offer is an opportunity to perform with professionals considered to be at the top of their fields. And the organization has worked hard to open up opportunities. Last year we did the full “Messiah” run in December, and that was a spectacular experience in which the two [youth] groups had a three-show run at Symphony Hall with Harry Christophers and the professional ensemble. The students performed extraordinarily well, so H+H came back with the possibility of repeating that type of venture this year. “Messiah” was the first time we’ve joined on a masterwork, and the Mozart Requiem will be the second. Q. What does it mean for a young singer to be a part of this? A. I get a lot of feedback [from the students] about what this means. The students truly understand what a special opportunity this is to sing with the Handel and Haydn Society at Symphony Hall, one of the most storied concert halls in the world. It is something that becomes a musical highlight, not just of the year, but for the rest of their lives. They really, truly value the experience; they talk about the experience; they share it with other students when they go back into school. They’re just extremely excited for this. From my perspective it’s always funny watching a group of teenagers who are so incredibly pumped up to perform the music of Handel and the music of Mozart, and they’ve added a cool factor to classical music that has become truly infectious with other singers. Q. What’s the biggest challenge in doing the Requiem with these kids? A. It’s that it truly is a heavyweight of the choral world. It’s 80 pages of choral score that’s in our hands, and for a student to understand the overall picture of a large masterwork, and understanding the language, and the musical significance, and the sheer technique and experience of singing the work with the right style, pitches, rhythm . . . all of that just presents a marvelous challenge. But it’s that challenge that excites us and something that we just live together, to bring this wonderful piece of music to life. Interview was edited and condensed. Zoë Madonna can be reached at zoe.madonna@globe.com. Follow her on Twitter @knitandlisten. Madonna’s work is supported by the Rubin Institute for Music Criticism, San Francisco Conservatory of Music, and Ann and Gordon Getty Foundation.